“LEADERSHIP and the New Science” provides a radical new paradigm for organizations, leadership and change. However, to understand the new theory that the author Margaret Wheatley proposes, one must understand the new science that serves as the foundation for her theory. 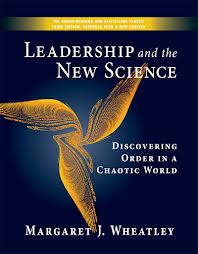 The book proposes a shift from a mechanistic Newtonian view of organizations and management to a “new science” view of organizations, leadership and change. The new science referred to is a composite of quantum physics, chaos theory and self-organizing systems. The author’s assumption is that the laws of nature can be applied to organizations and consequently, since science is a way of understanding nature, science in turn can provide a framework for understanding organizations. Since the 17th century, classical mechanics, a term coined in the early 20th century to refer to a system of physics began by Isaac Newton, had been the dominant way of explaining the universe. Newton is well-known for his universally accepted theory of universal gravitation and the three laws of motion. However, with the discovery of quantum mechanics, classical mechanics was revealed to be applicable only for large objects and speeds that do not approach the speed of light. Quantum mechanics provided an explanation for the atomic nature of matter and the wave-particle duality of atoms and molecules (Wikipedia). The Causal Model of Organizational Performance and Change echoes this concept. In this model, 12 variables were identified as crucial factors to organizational performance and change, namely: 1) external environment, 2) mission and strategy, 3) leadership, 4) organizational culture, 5) structure, 6) management practices, 7) systems, policies and procedures, 8) work unit climate, 9) task and individual skills, 10) motivation, 11) individual needs and values and 12) individual and organizational performance. Each of the factors is linked to one or more other factors. Drawing from “organizations as open systems” theory, the model proposes that any change in any of the factors would cause a change in the other factors as well (Burke & Litwin, 1992). As an Organization Development (OD) Consultant, I see validation of this idea in the change management initiatives I have facilitated. Sometimes, I am able to discern ahead of time critical elements within the organization that would be affected by a step in the process of change. However, many times, I faced unexpected negative consequences because of my failure to see the other variables in the change process. Like the relationships of subatomic particles which can be gleaned only from a high powered microscope, some factors within the organization are oftentimes hidden and must be discerned by an observant change agent. Herein lie the value of the initial steps of Scharmer’s Theory U change process which are co-initiating and co-sensing (2007). In the Philippine setting, relationships are very relevant since Filipino cultural values place a high importance on relationships. This is both a boon and bane to change initiatives in the Philippines. For example, the interconnectedness of the military, big business and government officials during martial weakened the democratic institutions in the country. On the other hand, the strengthening of collaboration among the public and private sectors and civil society can be the key to restoring good governance in the country. According to the theory of self-organizing systems, systems have the ability to transform themselves in accordance with its identity (“self-referencing”) as a response to the changing environment. Wheatley refers to this as “autopoiesis (p.85).” Hartl (1991) also writes that “Human organizations are self-organizing and form multi-leveled structures. They simultaneously have the capacity to function autonomously and as part of a larger system. Each subsystem tends to organize itself accordingly.” The characteristic of “self-referencing” is also evident in the companies that are “built to last” who “preserve the core” (Collins & Porras, 1994). My OD consulting practice is premised on the belief that systems can organize themselves into more adaptive organizations in order to survive and thrive in the new environment. If the OD consultant does not have this faith, she could very easily lose her will to continue when change initiatives meet resistance from many quarters. For the Philippines, this concept provides hope that the country will eventually move towards an efficient and progressive nation as it strives to emerge from the ugly cocoon of corruption. After emerging from that cocoon, the nation can become paradoxically both transformed and true to our Filipino identity. Chaos Theory is derived from the discoveries of “strange attractors” and fractals. “Strange attractors” prove that amidst seeming chaos and randomness, patterns evolve revealing an order that is at work in the universe. This evolution is non-linear which means that the slightest variation in the inputs can result in vastly different outputs. Applying this to organizations means that organizational behavior can be unpredictable. Having worked in organizations for more than 30 years, I have seen behaviors of individuals who provide an inkling of the non-linear dynamics at work in the organization. For example, I observed that participants in a training program hide their work from each other before presentations, a clue that “turfing” was a reality in their organization. In a meeting, managers would have the habit of “stonewalling” or figuratively shoring up their defenses in preparation for the verbal attacks of an aggressive CEO. In the Philippines, leadership is reflected in various government institutions and units. How the President behaves is a role model for all the leaders below him. And how leaders in the organizational hierarchy behave is an example for their followers’ behaviors. For instance, President Noynoy Aquino has a strong anti-corruption program. He has also appointed his cabinet and other heads of agencies on the basis of integrity. Now, government personnel are encouraged to be honest since they can no longer use as an excuse that higher ups are bigger thieves than they are. New Science: Truth or Metaphor? Close to two decades after “Leadership and the New Science” was first published, the “new world” that its author Wheatley envisioned for organizations is still yet to be fully realized. She wrote, “Twelve years after preparing the Second Edition of Leadership in the New Science, I’m still trying to come to terms with the experience of seeing, feeling, tasting and working earnestly from a new paradigm while living in the old one (2007, “Journeying to a New World,” para. 1).” And while the new science has achieved some acceptance in the scientific community, ordinary people like us have yet to understand and appreciate it. Whether or not the new science is truth or is just serving as a wonderful metaphor on how to look at organizations, many of Wheatley’s ideas on organization, change and leadership strike a familiar chord looking at it from rational and OD perspectives. Unfortunately though, Wheatley has not expressly laid out the role of leadership in the new quantum world in much detail despite the book’s title. But she defines it in a subsequent article entitled “The Irresistible Future of Organizing” (Wheatley & Kellner Rogers, 1996). The book is exploratory in nature and merely lays the framework of the connections of the new science to organizations, leadership and change. Thus, it provides a rich source of research questions. What conceptual model could be drawn to provide an integrated and coherent analysis of the new science and its application to organizations? What other aspects of quantum physics, chaos theory and self-organizing systems theory can work in the organizational world? How can application of these theories ensure a higher chance for success in change initiatives? Further research could also propose a change process model based on the new science similar to Kotter’s eight stages of leading change (1996), Scharmer’s five stages of the Theory U process (2007) and Beckhard’s four-stage model of planned change (Osborne & Brown, 2005). A comparison of leadership based on the new science and other leadership concepts such as transformational leadership would also be helpful. Bateman, T. S. & Snell, S. A. (2007). Management: Leading & Collaborating in a Competitive World (7th ed.). New York, New York, U.S.A.: McGraw-Hill Irwin. Burke, W. W. & Litwin, G. H. (1992). A Causal Model of Organizational Performance and Change. Journal of Management Vol.18, No. 3, 523-545. Collins, J. C. & Porras, J. I. (1991). Built to Last: Successful Habits of Visionary Companies. New York, New York, U.S.A.: HarperCollins Publishers Inc.
Kotter, J. (1996). Leading Change. U.S.A.: Harvard Business School Press. Osborne, Stephen P. & Brown, Kerry (2005). Managing Change and Innovation in Public Service Organizations, New York, N.Y.: Routledge. Scharmer, O. C. (2007). Theory U: Leading from the Emerging Future As It Emerges. The Social Technology of Presencing), Cambridge, MA: SoL Press.